These hills both show the importance of doing your homework before setting off. In both cases, the largest cairn does not mark the highest point. On Moruisg, the summit is marked by a smaller cairn found south-east of the main cairn. 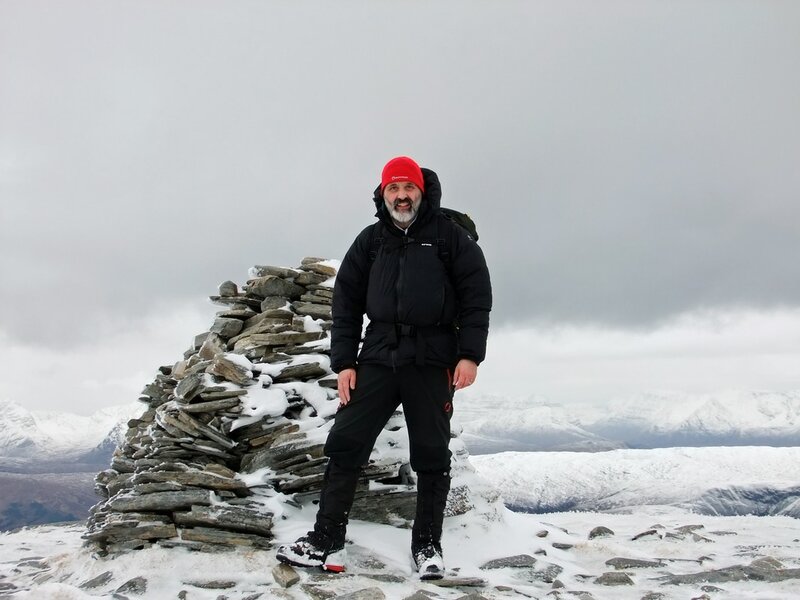 The summit of ​Sgurr nan Ceannaichean is marked by a small cairn SSE of a much larger cairn. I left home a little after 0630, enjoying the quiet roads while listening to Biffy Clyro's Ellipsis. The starting point was easy to find and with my winter boots on, I set off at just after 0830. My departure coincided with the arrival of another car; a man and his dog, who were to catch me up around half-way up Moruisg. After a bit of a chat, both man and beast returned to their earlier pace and were not seen again. I guess that they did not linger long at the summit due to the cold wind. 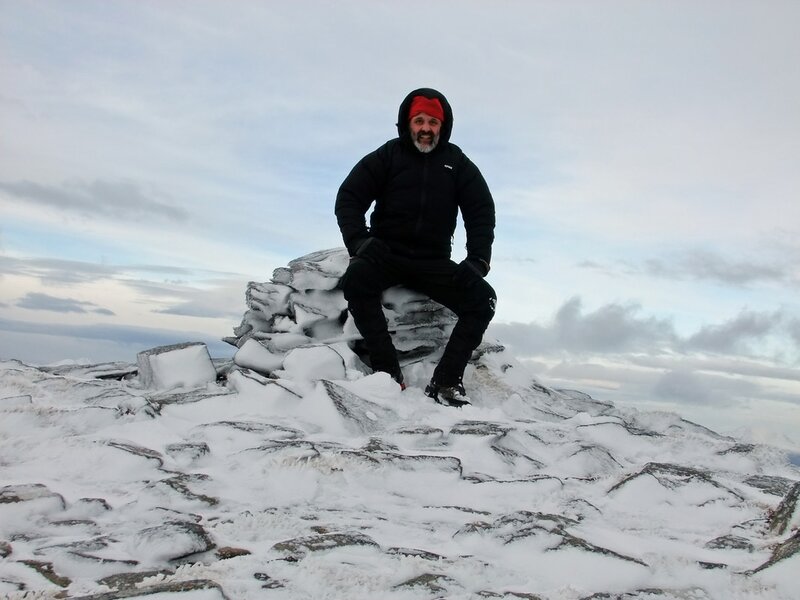 After initially reaching a large cairn, I pushed on to the true summit marked by a smaller cairn. I set up the camera on my tripod and set the time delay to 10 seconds. I counted downwards as I moved into position - 10..9..8..7..6..5..4..3..2... at which point, the camera blew over result5ing in a macro shot of the ground! My second attempt produced better results, though I should sort out my hat and make sure that my hood is on fully next time as I look like a matryoshka doll! Low cloud was extensive to the south; very different to the views north. 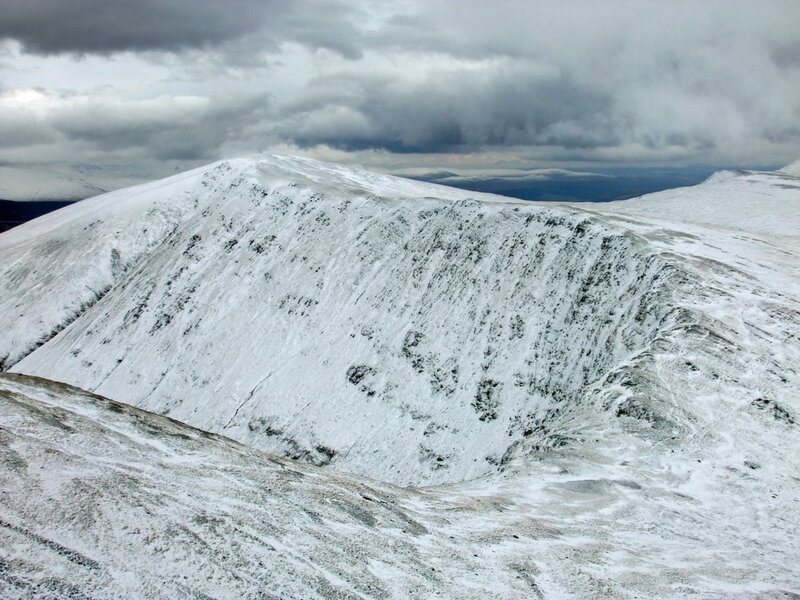 I put on crampons during the descent as I did not want to be caught out by a sudden patch of ice. The snow cover was mostly thin and they were not very stable over the rocky ground, so I tightened my boots to give a bit more support. 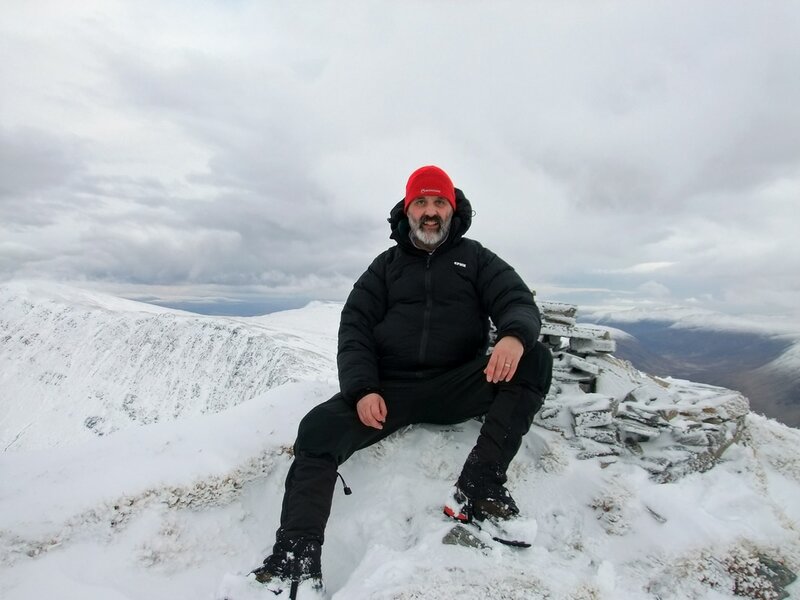 I continued in crampons until reaching a large boulder half way up Sgurr nan Ceannaichean. Here, I removed my crampons and consumed the chunky soup, which was only lukewarm. I find that the large tins fill the food flask and stay warm for longer, but this was a standard size tin. It was still very nourishing and helped to replace some of my lost fluids. As I continued towards Sgurr nan Ceannaichean, I saw two other walkers. The man (with the dog) and I had watched a car pull up at the layby but we did not see where the occupants went. They must have headed directly for Sgurr nan Ceannaichean via its north ridge. I was hoping that they might take my photo at the summit, but when I reached the large cairn, they were sat some distance away to the west. As I wondered over to the smaller cairn marking the true summit, I wondered if they had visited the summit or if they considered it bagged without actually standing foot on the highest point or if they did not concern themselves about such obsessive details. The true summit of ​Sgurr nan Ceannaichean - definitely a better selfie than that taken on Moruisg! The bitterly cold wind experienced on Moruisg was gone and the air was almost still, allowing me to linger. Operating the camera is so much easier when removing one's gloves and I remained in the summit area for a good 20 minutes, drinking coffee and taking photographs. I stopped off at the larger cairn for a final selfie shoot before heading back down, initially the same way as I had gone up but then heading north down a ridge to pick up the path that runs down from Coire Toll Nam Bian and ultimately leads back to beneath the railway and on over the bridge across the River Carron. The larger cairn on ​Sgurr nan Ceannaichean - How many people have reached this point thinking they were at the top?